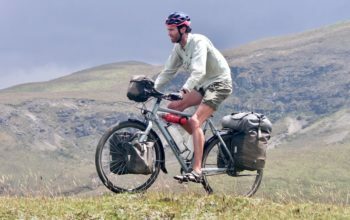 In 2010, the first Pinion gearbox was fitted to a bike that was cycled across the Himalayas. 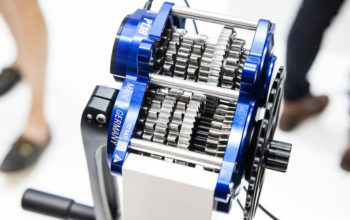 By 2012, the world’s biggest bike trade show, Eurobike, had a handful of bikes built around the 18-speed Pinion P1.18 gearbox, impressing bike travellers – myself included. Today, over one hundred bike manufacturers build their frames around the seven different models of Pinion gearbox. A Pinion gearbox is a fully sealed oil bath of cogs located at the crankset which offers 6, 9, 12 or 18 different gears covering a wider gear range than most 2x and 3x drivetrains. The Pinion system bolts directly onto frames designed to accommodate the technology, meaning there is no chance for a retrofit to your current frame. The Pinion Gearbox is integrated with the crankset and inside are two gearing sub-transmissions. When you pedal, energy first travels along the lower crankshaft before transferring to one-of-six cog sets in the 1st sub-transmission. The energy is then sent along the upper shaft to the 2nd sub-transmission which offers a high, medium or low version of the initial six gears (6 x 3 = 18 speed). The energy then makes its way back down to the crankshaft again where it can be sent directly to the outside chainring (these three output cogs are free-floating on the crankshaft). The job of the gearbox is to change the chainring speed based on the gear selected, meaning the chainring always spins faster or slower than the crankset. Pretty cool! If this description made no sense to you, check out THIS video describing the process in much more detail, or THIS series of diagrams on the Pinion website. In this resource, I’ll be discussing the pros and cons of the Pinion gearbox, then I’ll compare it with the Rohloff hub, and lastly, I’ll be nerding out on everything else you can possibly know about this engineering marvel! Note: This article was originally published in September 2012 but has been completely overhauled April 2019. A Rennstahl 931 stainless steel touring bike equipped with Pinion gearbox. The key feature of the Pinion P1.18 gearbox is its 636% gear range. Compared to any other drivetrain, you’ll have easier gears for the steep mountain roads (4km/h) while also having harder gears for the high-speed descents (50km/h+). In comparison, other gearboxes available like the Rohloff 14-speed gear hub measure in at 526% and the Shimano Alfine 11-speed hub at 409%. A 30-speed derailleur drivetrain is the only option that can get close to this range (620% maximum). Pinion gearboxes are a fully sealed gear system, making them impervious to mud, grit, dust, snow and sand. If you spend a lot of time riding in harsh conditions, these gearboxes may just be your savior. The only maintenance that you need to complete to the gearbox is a 60ml oil change every 10,000km (or every year, whichever comes first). This job is easy enough to do yourself in remote areas as long as you carry the appropriate syringe, line and oil. Pinion drivetrains have very few parts that are susceptible to external damage. You’ll find no exposed derailleurs, delicate hangers or brittle cassettes on a Pinion-powered bicycle. This is especially handy if you fly with your bike, as baggage handlers are notoriously ruthless with the way they throw around bike boxes. Getting the brushes between your cassette teeth, derailleur pulleys and chainrings is time-consuming and annoying on a bike trip. You can avoid almost all of this nuisance with a Pinion gearbox, especially if you pair it with a carbon belt drivetrain. This is a particularly handy feature for a loaded touring bike. For example, you can pick your gear before you take off at the traffic lights, or select the appropriate gear for starting on an incline. Thanks to the Pinion gearboxes twist shifter, you can change multiple gears in one go; the limitation is the range of motion in your wrist. You should be able to change about eight gears at once, which I’ve had to do under rapid deceleration on sandy roads. There is a constant 11.5% jump between each gear, making gear changes very predictable. These gear steps are also very small, allowing you to fine-tune your pedalling cadence at whatever speed you are travelling (P1.18). In comparison, the Rohloff hub has a slightly bigger jump between each gear (13.6%). Belt drive combined with a Pinion gearbox on a Hilite bicycle. As soon as you change the gear at the shifter, the gearbox is instantly engaged in the next gear and ready to go – there’s no dilly-dallying around here! As the Pinion gearbox doesn’t require tuning like a derailleur, so there’s no chance of gear slipping either. 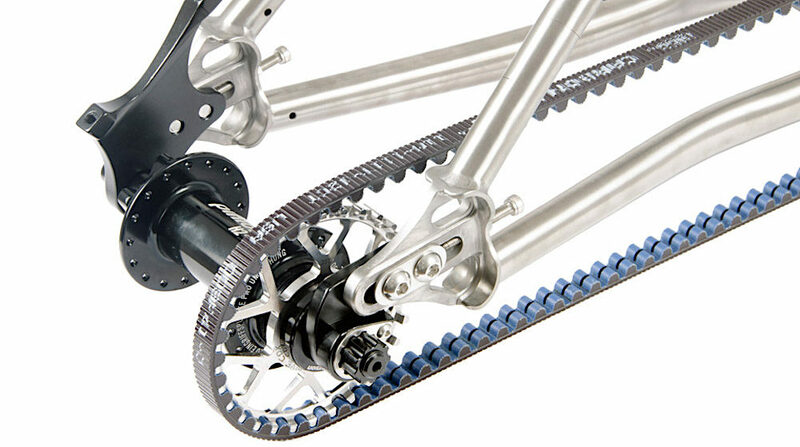 The chain line on a Pinion drivetrain is perfectly straight, resulting in less chain wear. 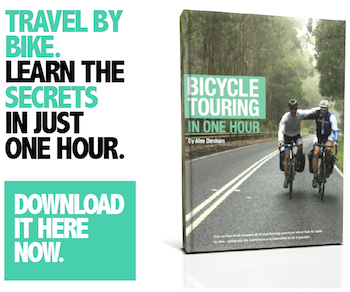 This equates to a longer chain life; I know people who’ve toured for 10,000km+ with a single chain. 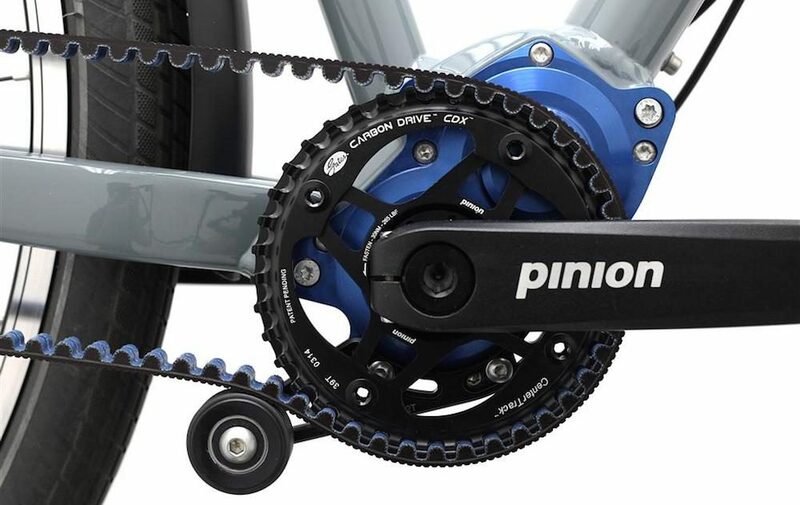 Choose carbon belt drive with your Pinion gearbox and you’ll likely achieve 20,000km+. 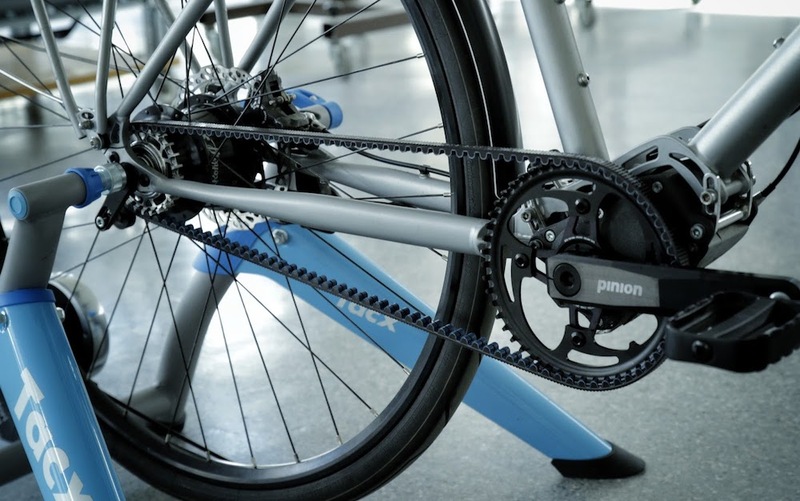 The Pinion gearbox allows you to use a single speed rear hub design. As the cassette body section of a single speed hub is shorter, it allows hub manufacturers to offer a wider hub shell, resulting in a near zero-dish wheel build. What this means is that you’ll have extra wheel strength and durability thanks to the more even tension across the spokes. The two shifting cables connect to the non-drive side of the Pinion gearbox. 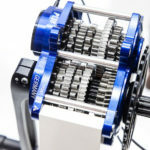 The Pinion gearbox adds 200 to 700 grams when compared to the equivalent Rohloff hub, and 600 to 1100 grams when compared to a 3x touring drivetrain (the weight variance depends on the gearbox model). The Pinion-specific frames also add a few hundred grams. But remember to keep these numbers in perspective; when you consider the weight of a bike loaded with luggage, food and water, these figures are rather insignificant. My precise drivetrain weight analysis can be found HERE. The Pinion has additional frictional losses when compared to other drivetrains. I’ve actually estimated it to lose 3-4 minutes per 100km when compared to a Rohloff hub or derailleur gear system. You can read my full analysis HERE. There’s no beating around the bush here – Pinion gearboxes are the most expensive drivetrain you can buy. Expect to pay a minimum of €3000 for a bike complete with a P1.18 gearbox. You can somewhat justify the cost of buying a bike with a Pinion gearbox knowing that you won’t need to replace anywhere near as many cassettes/chains/chainrings – but you’ve got to ride your bike for many years to get that payoff. Luckily the gearbox will probably last as long as you do! A bare Santos frame showing the six mounting points for a Pinion gearbox. While an internal gear hub can be fitted to almost any frame, Pinion gearboxes require a dedicated frame design that’s specific to its six-bolt design. This essentially means that you can’t change your mind and go back to derailleurs (or an internal gear hub) down the track. In the event of some kind of mechanical failure, you will need to ship your Pinion gearbox to Germany for repair. I can understand that this may be a deterrent for you if you spend a lot of time in remote locations. That said, many people have already travelled to some of the hardest-to-access parts of the world with Pinion gearboxes, and the consensus is that complete failure is highly unlikely. I know a few people who’ve had oil leaks on their bike trips (luckily this probably won’t stop you being able to ride), and there were some early issues with the crank arms working themselves loose. But year-on-year the Pinion gearboxes are getting more reliable. Need a new cog, some cables or some gearbox oil? You can’t just go to any old bike shop to pick them up. Most of the time you’ll have to plan ahead of time and order any replacement parts online or through a dealer. Pinion offer their gearbox with a neat twist shifter, but there are also aftermarket options available (more below). The twist shifter divides people; I personally love twist shifters as I can dump many gears at once. The good news is that if you use flat bars you can now switch to some aftermarket trigger shifters. 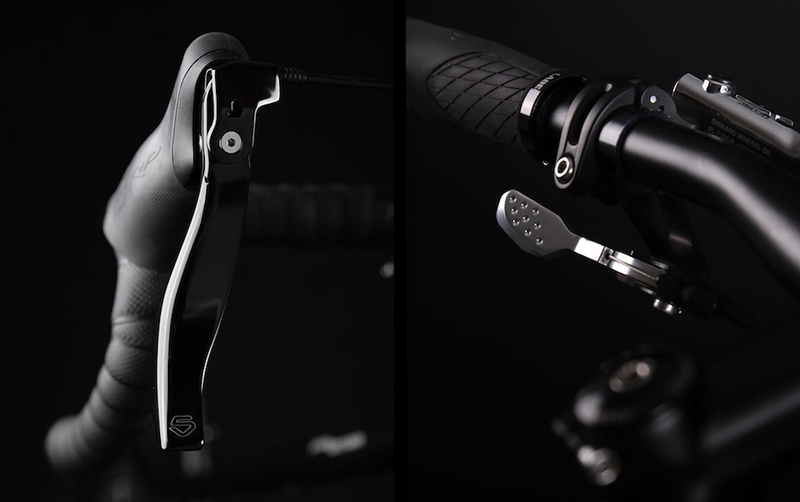 And for those with drop handlebar bikes, there are a few nice aftermarket shifter options for you too! While it’s not best practice to shift under load on any drivetrain, a derailleur has a much higher tolerance for it. There is a technique to shifting with a Pinion gearbox where you’ll need to back off on your power for a split second to make the shift. This takes a bit of time to master but becomes second nature in no time. – Pinion gearboxes have a wider gear range at 636% compared to 526% for a Rohloff hub. – Smaller gear steps at 11.5% compared to 13.6%. – Five-year warranty compared to two-years with a Rohloff hub. – It runs silently in all gears whereas the Rohloff makes a whirring sound in gear 1-7. – 10,000km oil changes (or one-year) compared to 5,000km with a Rohloff hub. – You can change wheelset sizes (eg. 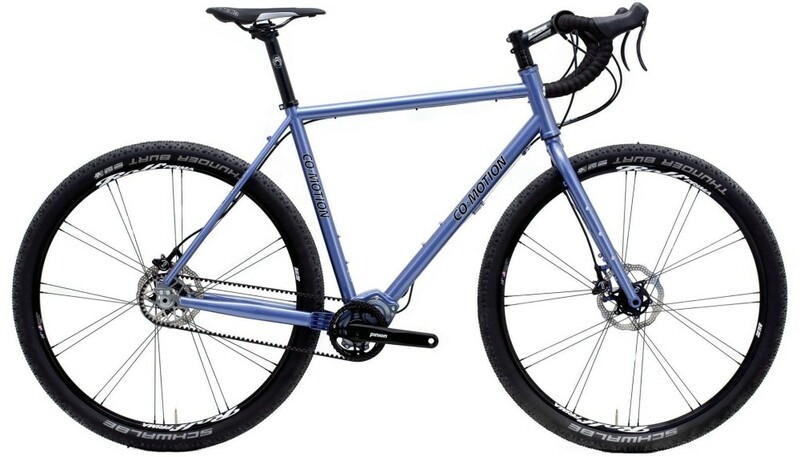 29″ and 27.5+) if your bike permits it (as opposed to needing two Rohloff hubs). – Easy to swap out the entire gear system if there is a failure (compared to dismantling/rebuilding a Rohloff wheel). – The numbers suggest the Rohloff hub is more efficient in terms of energy transfer than a Pinion gearbox. – Rohloff frames are a touch lighter to build. The hub itself is 700 grams lighter than the equivalent Pinion P1.18 gearbox too. 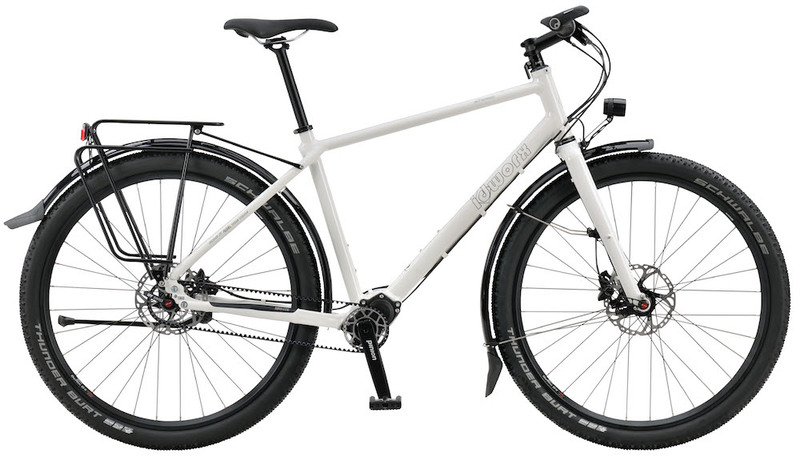 – Rohloff bikes are around €700-1000 cheaper (that’s US $1000+). – Faster ‘pickup’ between pedal stroke and gear engagement (the gearbox and hub freewheel need to engage on a Pinion). – Gear cable changes are much easier. – Compatible with mid-drive eBike motors. – With over 20 years in production Rohloff have had more time to iron out any kinks in the product (Pinion have been producing gearboxes for eight years in comparison). 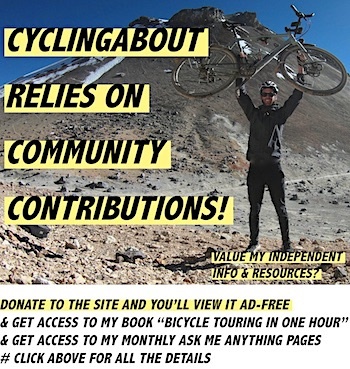 Click HERE to read my article 16 Reasons To Tour With A Rohloff Hub. 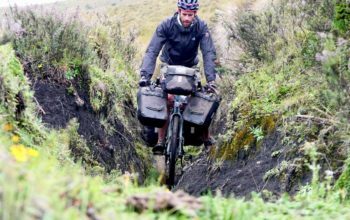 The P-Line is most commonly found on touring and bikepacking bikes as the gear range and gear steps are unparalleled by any other drivetrain type (P1.18). In addition, the extra weight of this gearbox is almost insignificant by the time you add equipment, food and water to your bike. P1.18 // 18 gears. 636% range. 11.5% gear steps. 2700 grams. 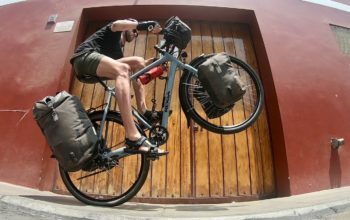 Best for touring and bikepacking bikes. P1.12 // 12 gears. 600% range. 17.7% gear steps. 2350 grams. Best for mountain bikes. P1.9XR // 9 gears. 568% range. 24.3% gear steps. 2200 grams. Best for e-bikes. P1.9CR // 9 gears. 364% range. 17.5% gear steps. 2200 grams. 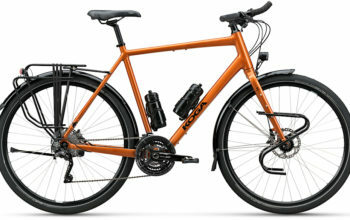 Best for urban bikes. The C-Line may have a slightly reduced gear range and larger steps between each gear, but these gearboxes have the advantage of a 250-gram weight saving due to the magnesium body, plus they’re 8mm narrower between the pedals (q-factor). C1.12 // 12 gears. 600% range. 17.7% gear steps. 2100 grams. Best for mountain bikes and off-road bikepacking bikes. C1.9XR // 9 gears. 568% range. 24.3% gear steps. 2000 grams. Best for e-bikes. C1.6 // 6 gears. 295% range. 24.3% gear steps. 1800 grams. Best for urban bikes. Weighing up between these two gearboxes? For touring/bikepacking, it’s recommended to go for the P1.18 as the gear steps are much smaller. This allows you to keep your pedalling speed (cadence) much more constant with gear changes (most noticeable when cycling on the flat). If you’d like to get a feel for what each of the 17.7% gear jumps would be like, you can shift from the 36-42t on a mountain bike cassette or 11-13t on any other cassette. The most common form of chain/belt tensioner is sliding dropouts. By incorporating a small adjustable retaining bolt, you’re able to ensure the wheel is perfectly aligned when setting up, and it makes wheel installation/removal a breeze. Pictured is a lovely stainless steel dropout manufactured by Co-Motion Cycles. Tout Terrain offer belt/chain adjustment up front via an eccentric gearbox mount which is super neat. A small dial makes any fine tuning very simple. A handful of companies use a roller at the gearbox which is said to maximise the rear triangle stiffness for belt drivetrains. 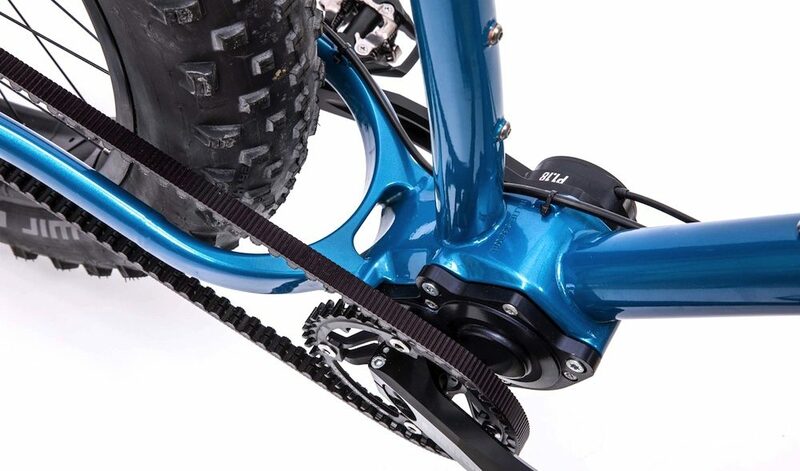 Pictured is a belt tension designed by Santos Bikes. A 32 tooth front sprocket can be combined with 20-34 tooth cogs in two-tooth intervals (eg. 20, 22, 24). A common drive ratio for Pinion gearbox touring bikes is 32-28t as that can have you pedalling at 5km/h with a decent cadence for climbing, and 53km/h in the top gear on the downhills. The closer you get to 1:1, the steeper the hills you will be able to cycle – 32-32t is recommended for off-road riding. 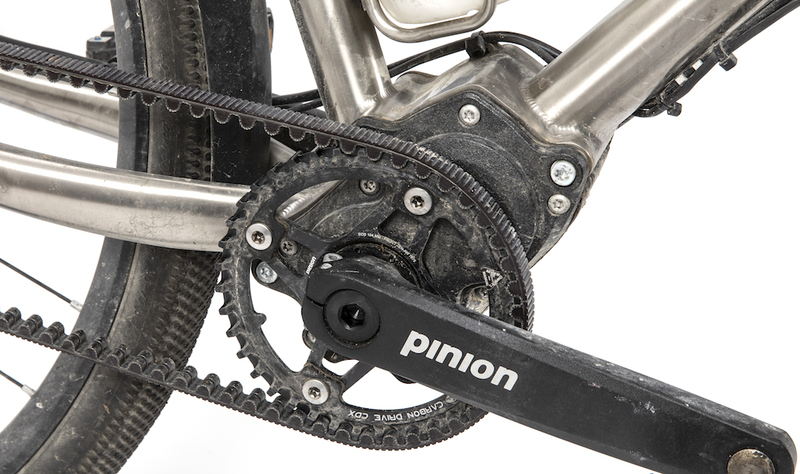 Pinion has a series of sprockets/chainrings for travelling in extreme conditions. The teeth of the ‘Longlife’ series chainrings are 1mm wider and are designed for use with their extra wide X101 chain. 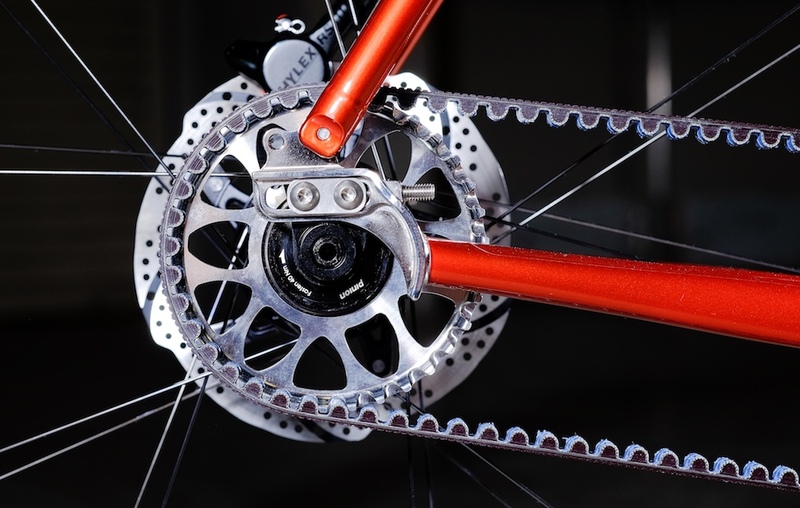 The front chainrings are available in 30 teeth, and the rear sprockets are available in 30 or 26 teeth. A recommended setup for touring would be 30-26t, which matches very closely to a belt drivetrain running 32-28t. You can calculate your gear inches, or speed at certain cadences HERE. Belt drivetrains, when combined with Pinion gearboxes, will decrease your drivetrain maintenance significantly. You can find out everything you ever need to know about Gates Carbon Belt Drive HERE. 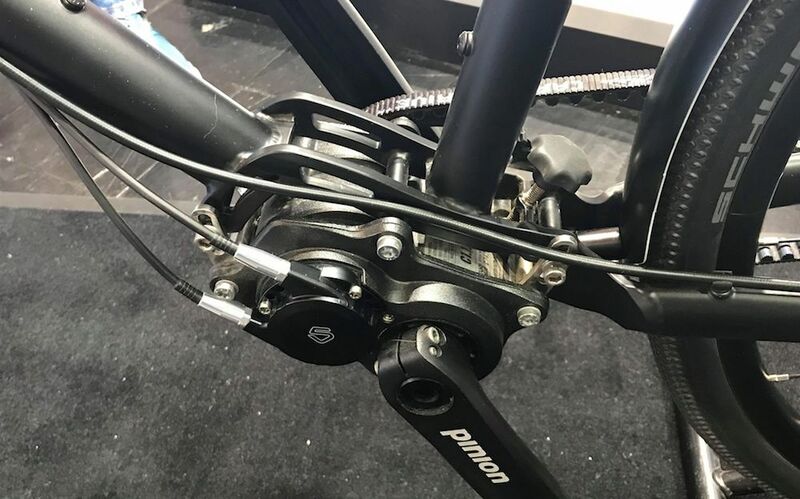 Pinion have created a special offset spider and extra-wide crank arms so that you can mount their gear system to a fat bike. 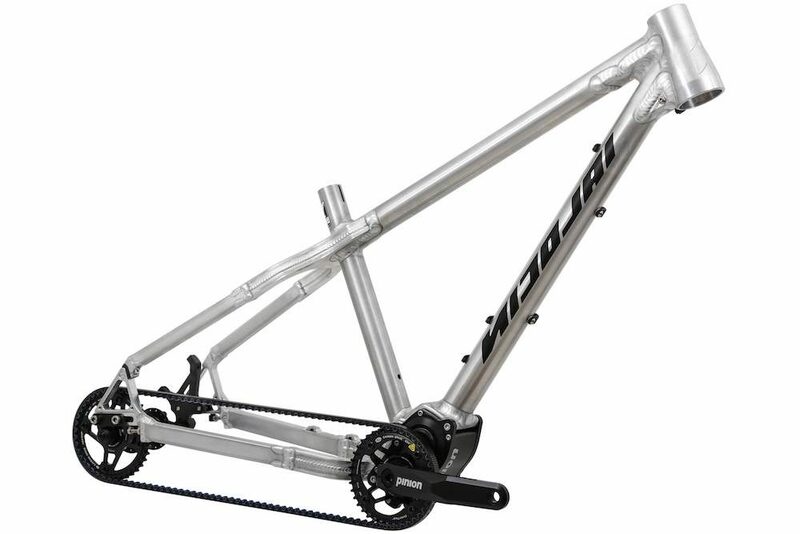 Pictured above is a Centurion, but you can also find Pinion fat bikes from Mi Tech, Nicolai, Ventana, Carver and Hilite (pictured). Wondering why there is only one Pinion tandem in existence? 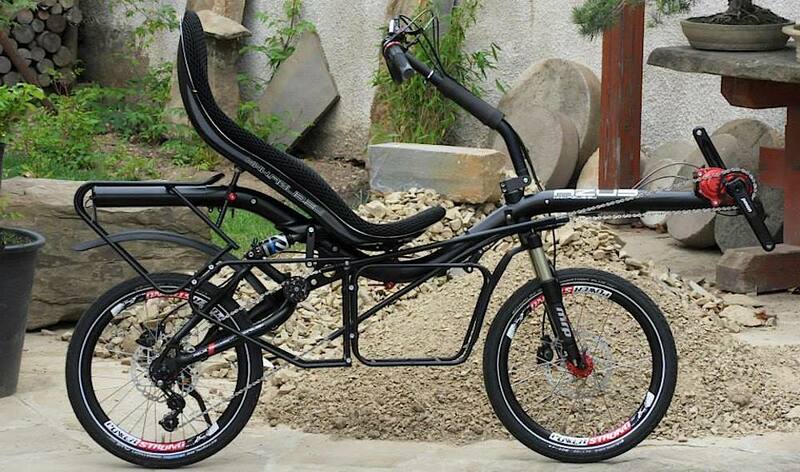 Well, it requires some custom machined parts plus three belts to pull it off – and Co-Motion Cycles did just that! The difficulty is that you cannot fit the gearbox at the rear crankset (stoker) because Pinion does not offer a tandem crankset. And you cannot locate the gearbox at the front crankset (pilot) because the Pinion chainring spins at a different rate depending on the selected gear (therefore, it can’t be used as a tandem ‘timing chain’). Pinion gearboxes are becoming more and more popular on touring recumbents. Pictured above is a dual suspension Azub Mini with red Pinion P1.18 gearbox. Cinq5 have just released these neat trigger and road shifters for the Pinion gearbox. While you can use any cassette hub with a Pinion gearbox, single speed hubs are the most ideal because the distance between hub flanges is wider and almost zero-dish, resulting in stronger wheel builds. Due to the slow-ish engagement of this Pinion drivetrain, you’d ideally fit a hub with as many engagement points as possible to reduce the delay between pedal stroke and rear wheel drive. Top-notch single speed hubs include the Onyx Hyperglide SS with instant(!) engagement, Industry Nine Hydra with 690 engagement points, Pinion H2R with 120 engagement points and Chris King ISO with 72 engagement points. 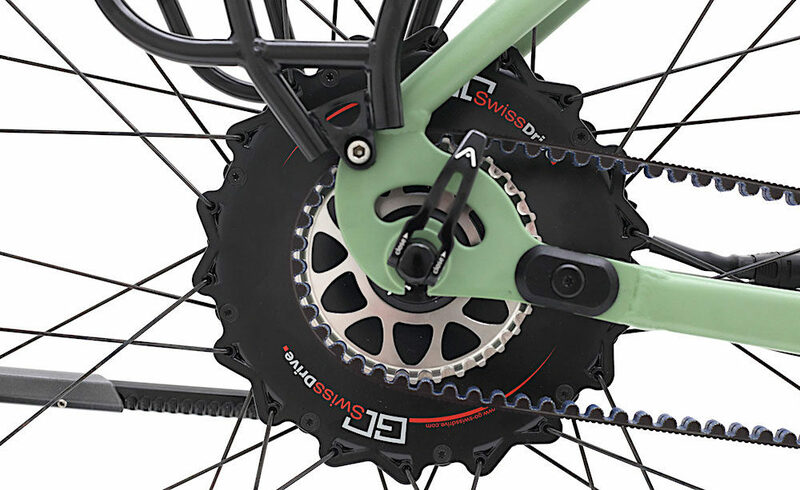 Santos uses GoSwissDrive hub motors for their Pinion eBike builds. As the Pinion gearbox occupies the space of a mid-drive electric motor, it means front or rear wheel motors are the only compatible options. While many excellent rear hub motors are available, it’s worth noting that the mid-drive motor design is often regarded as the ‘best’ motor type overall. This is because mid-drive uses your bike’s gears, resulting in optimal torque in a variety of situations (eg. climbing or on the flat). Mid-drive motors tend to be both a bit more efficient (better range) and effective (especially on hills). You can read all about electric touring bikes HERE. The Co-Motion Divide Pinion is custom made for you from US $6715. In comparison, the Rohloff version tallies up to US $5560. 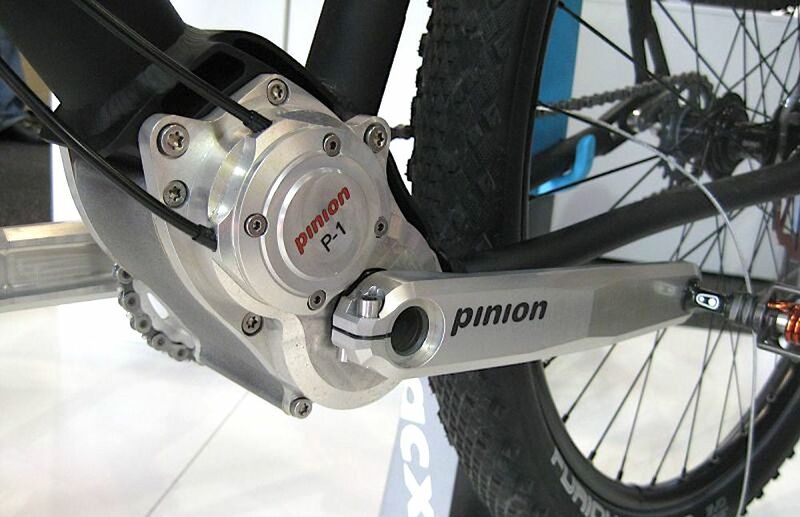 Pinion gearboxes are only available for bike and frame manufacturers. Touring bikes with Pinion gearboxes start at €1999 for a P1.9CR model and €2949 for a P1.18 model, while most premium bike brands offer builds in the €4000-5000 range. 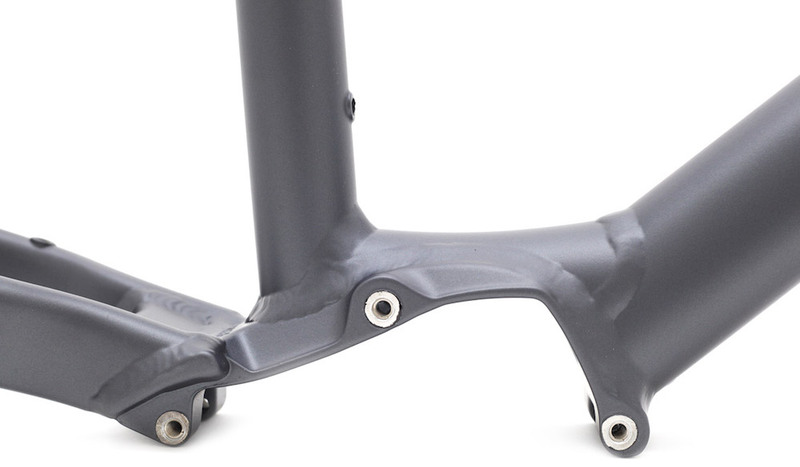 Framesets with Pinion gearboxes are often in the €2000-3000 price range. When comparing complete bike prices between Pinion and Rohloff builds, most manufacturers charge a premium of €700-1000 for a Pinion P1.18 equipped bike, with all other components equal. 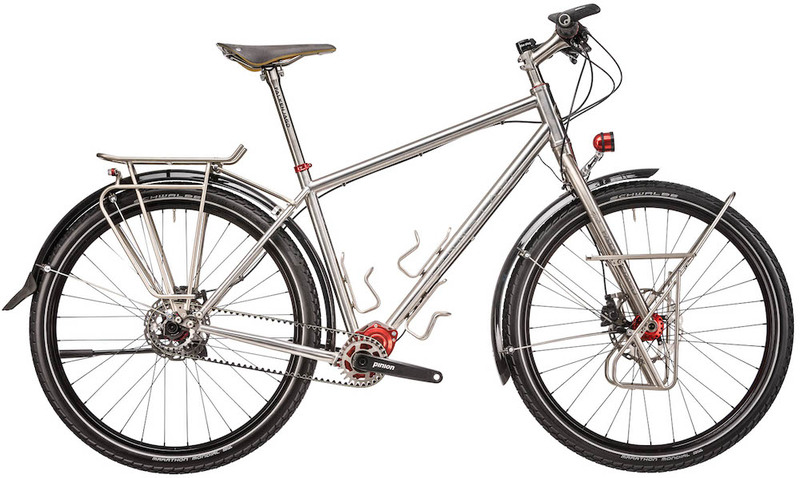 The IdWorx oPinion aluminium touring bike. There are more than 30 bike companies that produce touring and bikepacking bikes with Pinion gearboxes. You can find a complete list of the bikes available including pricing HERE. Have You Travelled With A Pinion Gearbox? How Are You Liking It?